April is here! Join us this year to host an ENGAGE with CO-AGE event April 29-May 3rd 2019. 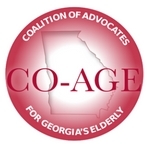 Last year more than 1,000 advocates attended 32 events across Georgia and heard updates from the legislative session on issues affecting older Georgians. The meeting in a box gives hosts all the tools they need from a script and videos to handouts. Contact us to host an event today! Visit www.gcoa.org/engage for more information or Eric Ryan at Eric.Ryan@gcoa.ga.gov.